Technically, I'm not even the best with identifying the rules for all of the grammatical mistakes I encounter. I just know they're wrong, and the heading for the Pablo Creek Library Valentine's Day display is wrong in so many ways. Let's count. 1. IT'S IN ALL CAPS. Not a big deal, really, but it feels a little harsh for a holiday about love. 2. It's comparing more than one book (books) to one box of chocolates. I might go with, "A book is like a box of chocolates," or "Books are like boxes of chocolates." 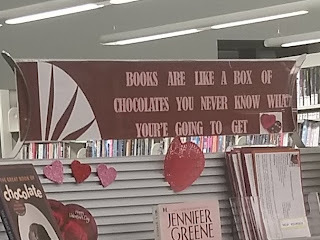 Or maybe even say that a library full of books is like a box of chocolates. Also, the point of the display is that the books are about love, and those books also have descriptions on the back cover. Also, most boxes of chocolates tell you what you'll be eating, so you only don't know what you're going to get if you don't real the label. I'd go with a colon or a dash after "chocolates." A colon tells the reader, "and that is." 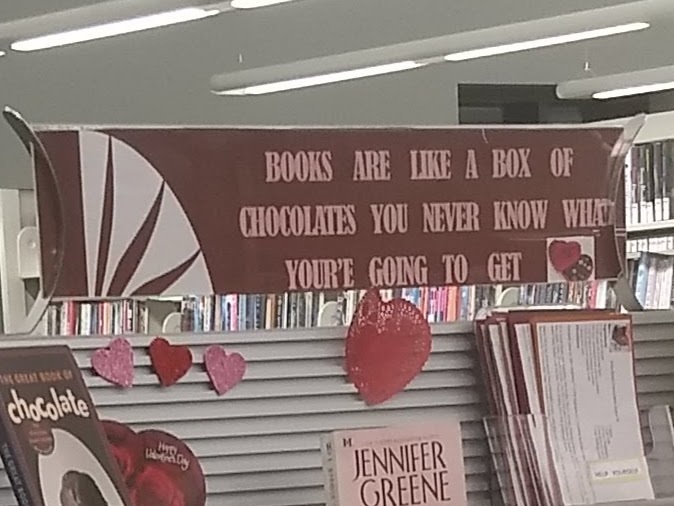 Without punctuation (and foreknowledge of the Forrest Gump quote), the sentence reads as, "Books are like a box of chocolates you never know." That's a perfectly legitimate sentence, and it makes sense if you don't read the books on the rack. Some people would be tempted to use a semi-colon, but that would be wrong, as would a comma (it creates a comma splice). I guess you could use parentheses around the definition. Oh, there should also be a period at the end, I suppose. BOOKS ARE LIKE A BOX OF CHOCOLATES: YOU NEVER KNOW WHAT YOUR'E GOING TO GET. 4. It's a misquote. Maybe the most misquoted misquote of our time. Besides "Play it again, Sam." Since the sentence is from a movie, and most of us know that, I'd probably go with the more colloquial "gonna" instead of "going to." Technically, Forrest also says that his momma always said life was like a box of chocolates, but this part of the expression has been misquoted for years, since we want to change it to the present tense. I suppose that's because we think it's a valuable lesson somehow (which it isn't). 5. There's a misplaced apostrophe. It's "you're," as in you are. Not "your'e," as in your he? Which isn't even correct, either, and it's not a contraction we use. Or it ain't one. It's just wrong. 6. The context is odd. This one's debatable, but Forrest does say the following: "I'm not a smart man, but I know what love is." The problem is that love, to Forrest, is basically unrequited and fairly unhealthy by our standards. He's more like a loyal puppy dog than a hero of a typical love story. And based on his own childhood, I wonder how he could know what love is. But the actual quote of life being like a box of chocolates is a lot like saying we have nothing to fear but fear itself. Kind of dumb and naive, like our English language.